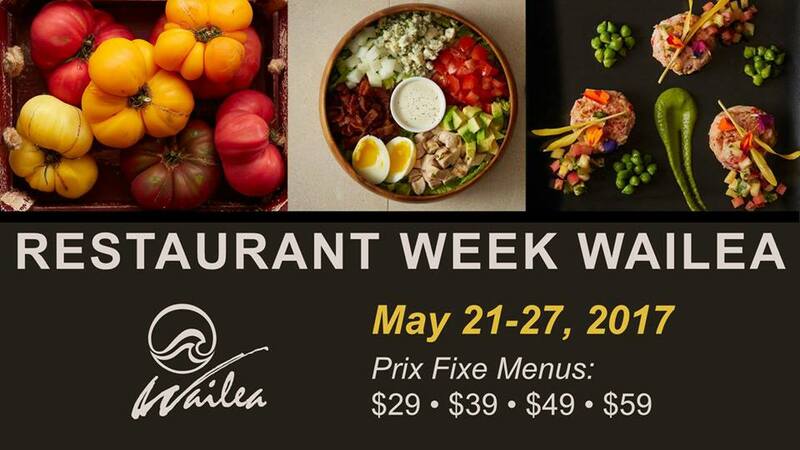 “Restaurant Week Wailea” is our celebration of Wailea’s finest cuisine taking place at 21 participating resort restaurants throughout Wailea twice each year. Wailea Resort is known for its award-winning culinary talent and delectable restaurants and celebrity chefs. In 2017, we’ll once again create some remarkable three course, prix fixe menus for just $29*, $39*, $49* or $59* per person (*depending on the restaurant – beverages, tax and gratuity not included). Some restaurants enhance this promotion, by creating wine pairings to enjoy with your meal, at a similarly special price. MauiNow is the Premier Media Sponsor of Restaurant Week Wailea. Log onto MauiNow.com to view Video & interviews with participating restaurants of Restaurant Week Wailea. Scroll down to see a video from the 2016 event. Click the menu image above to download the May, 2017 Restaurant Week Menu.